We have 75 years experience building high quality wooden cases and cardboard boxes. Our clients include McLaren Automotive, Aspreys, Aston Martin, News International and Red Bull. 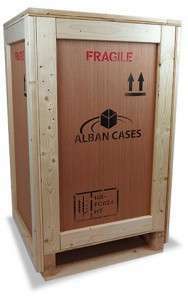 Manufactured in house, Alban Cases enjoys a global reputation for producing quality wooden cases and crates and producing a full FEFCO range of cardboard cartons to any quantity and design. Our team has many years of experience in the design and manufacture, which customers can draw upon for ongoing or one off projects from the very basic to the most complicated.